This bingo set can be used for either review or assessment. It is designed to be used in conjunction with the Greek and Latin Roots and Derivatives: Reference Cards and Card Sort materials, which covers all of the 40 roots used in the game. 2. Gather marker chips for game play –plastic discs, dry kidney beans, or M&Ms will work. 6. 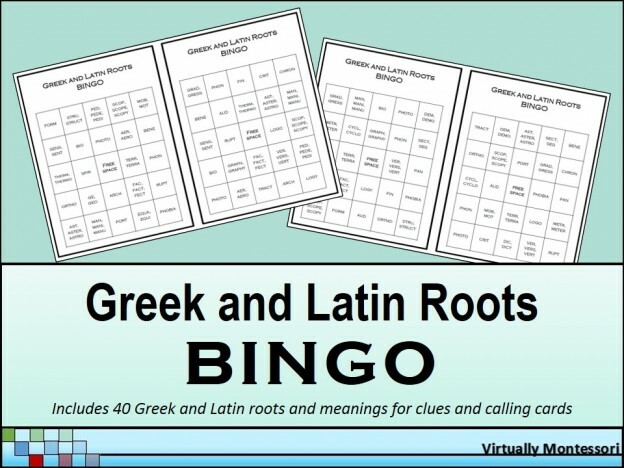 The caller chooses a calling card and reads the clue out loud (for example, “hand” – the clues are definitions of the Greek and Latin roots listed above). 7. Players recall which root matches the clue that has been called (ex: “hand” is the meaning of the root “man/mani/manu”), and mark that root with a marker chip if it’s on the players’ boards. 9. The caller confirms that all of the player’s marked roots have been called. If they haven’t, continue game play.